My partner's friend suffered from chronic pain for years. She experienced her first sustained relief after working with a healer whose methods apply new findings about neuroplasticity--how the wiring of the brain can transform itself. She continues to practice what she learned. When she first feels the painful sensations, she reminds herself that the pain occurs only in her brain, not elsewhere in her body (where physical causes have been ruled out). Then she redirects her mind to something else, like singing a song. Simplistic as it sounds, changing the channel this way has been revolutionary for her. She has stopped reinforcing the neural pathways of pain and has tangible evidence that they are dwindling. She is relaxing into longer and longer pain-free periods. This friend's experience suggests a powerful way to look at transforming your own mental pathways. The first, crucial step is to realize that the difficulty you face is happening in your brain. This reframe looks simple, and sometimes it is. It might be easy to remind yourself that pain is in the brain if you already believe it doesn't really indicate something wrong in the body or the world, even though it might feel like it does. But often it may seem irrelevant or inaccurate to see the pain as in the brain--especially when it looks like a difficulty lives outside, in our circumstances, with the brain only passively, objectively pointing it out. The mind's job is to project its interpretations outwards and to believe its own conclusions. It creates the often highly adaptive illusion that its interpretations actually are reality. This illusion makes for useful efficiency in many circumstances. We can go with our brain's best guess without being distracted by even knowing that a guess was involved. Usually the show is seamless. We might only become aware of the brain's magic of projecting interpretations as reality when there's been a misinterpretation of sense stimuli for some reason--when a mirage dissolves, for instance. But we're also influenced by a skillful illusionist when we believe there's no interpretation happening at all. Remember in The Wizard of Oz when the dog Toto pulls back a curtain, exposing the Wizard as he manipulates the mechanisms that have been producing such an impressive illusion for the heroes? The magician brain sometimes has these Wizard-of-Oz moments, intoning "Pay no attention to the one behind the curtain"--it tries to hide its own role in creating our experience. Someone I know suddenly lost hearing in one ear. When she's in bed, the window is to her right, the side where her hearing loss is almost total. So now she hears sounds from outside the window as if they were coming from the left, inside her apartment. But for her, there is no as if. Her brain confidently informs her, for instance, that a dog is barking outside her bedroom door (since she has no dog, she finds this unnerving). 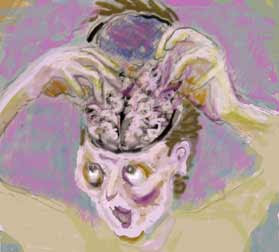 Her brain continues to interpret information as it did when she received sound data from both sides of her head. She gets to see the magician brain at work, spinning a story which might just as well be fiction as non-fiction. It looks like a (forgive me) no-brainer to say creative blocks and their pain happen in the brain. For instance, if you get harassed by jeering critical voices when you try to work, obviously the problem is in the head; where else could it be? But it can often feel like blocks are just the way things are, as if they were simply happening to you. Without really noticing, you can experience the discomfort of a habitual block as if it occurred out of reach of the brain that actually creates and projects it. You might believe that the pain of those critical voices was caused by people who said mean things like that to you long ago. If so, you're believing the fixed story of a past. However insightful it might be about the origins of the pattern, such a story hypnotizes you into forgetting that the pain now is being invented in your current neural pathways, which can change. Maybe as a deadline careens towards you, the pressure starts squashing your inspiration into roadkill. You just need another few days, or a better night's sleep. If you had more money or fewer responsibilities breathing down your neck you'd be fine....but right now you have a real problem. You didn't make it up. It truly seems like the difficulty is happening outside the brain's jurisdiction--the oldest slight-of-hand in the mind's bag of tricks. When you stop to consider, you see that the pressure problem comes not from the actual deadline, or the number in your bank account, etc, but from your reaction to these conditions, salted with ideas about your limitations and priorities, with a side of self-concepts about your worthiness, and so on. All that originates in your brain, not in the calendar or the bank's computer. You might be watching a gripping mental movie about how not meeting that deadline will lead to your being fired, eating out of garbage cans and applying all your creative zip to reorganizing the plastic bags in your shopping cart. "Fix it! Emergency! Emergency!" Your protective mind just amped up its job of convincing you that what it shows you is reality. "This pressure is real," it insists. And it is real, inside the mind that is experiencing it. As real as the phantom limb pain that the brains of amputees locate in a body part that no longer exists. Fear can sound as certain as a meteorologist predicting the chance of dawn tomorrow morning. But fear does not have the predictive power it seems to. Sure, maybe you'll find yourself pushing that shopping cart on the street, but maybe you'll be loading it up with high-end organic goodies in the supermarket instead. Where does fear exist? Is it in the future circumstances and consequences you want to avoid? However helpful it might be to consider possible outcomes when planning, they haven't happened yet and have no actual reality. Fear occurs only here and now, through the mental process of imagination and the bodily sensations that reflect it. All creative blocks involve fear in some form--fear of failure, success, or embarrassment, fear of change, of loss, of people's opinions. And no matter what their content, fearful thought patterns can change, once you realize that the pain is in the brain, nowhere else. OK, so now you're convinced by your reframe: you have your brain to thank for the experience of a creative block, not external circumstances, past, present or future. Based on the success story we started with, your next step would be to find an effective way to change the channel and stop reinforcing the mental pathways that got you into this pickle. With practice, that old road to suffering will disappear from disuse, as new mental pathways strengthen. Brain research confirms that this is literally, physically the way it works. How exactly to change the channel? This is a creative endeavor of its own, calling for experimentation. Getting creative about freeing your creativity has to come out of the particulars of your challenges. What might happen if you noticed the specific mechanism of a block and then consistently interrupted it with a change of focus at the first signs? Here are a few approaches you might want to play with. For brain circuitry to change, it first has to stop doing what it's always done. When people can't use an arm because the relevant part of their brain has been disabled by stroke, re-training the brain begins with stopping using the arm that still works. The 'good' arm is bound in a sling so that some of the neurons that direct it can re-wire to control the other arm. Intensive practice with the 'bad' arm creates the new pathways that are needed. Experiments have shown that neurons that fire together wire together--if different neural pathways are often used at the same time, they begin to physically integrate with each other until it becomes difficult to re-differentiate them. The habit of a creative block may be made up of a lot of different coordinated factors. To stop, to put the pattern in the equivalent of the 'good' arm's sling, might mean to practice inhibiting one or more factors in an almost mechanical way. For instance, I write very slowly. I've never been able to write a quick and dirty first draft, and I've tried. (It might be dirty, but it sure isn't quick!) The functions of editing, rewriting and writing new parts are usually all mixed together for me. I've noticed that I often go back to the beginning of a piece and reread, while editing, to orient myself before writing what's next. Sometimes that's useful, but I'm guessing it's often part of how I slow myself down. So I'm trying out stopping rereading what I've already got. When I don't know what's next, I simply stop myself from backtracking. I'm not being rigid about it, but my hope is that this might start to differentiate rereading and fresh writing from each other, and give me more efficiency and flexibility in my writing process. What part(s) of your block could you practice stopping? Neuroplasticity research has led to relief for amputees with phantom limb pain. Often a missing limb is experienced as painfully stuck in a position it was in before it was removed. New treatments use mirror boxes constructed like the props for a magic show. In them, the brain 'sees' a mirror image of a missing limb and moves it; this allows the brain to stop sending out its message of stuckness. When affirmations work, perhaps a similar trick is involved. You convince yourself that your illusion of stuckness has already been resolved. You might experiment with giving yourself tangible signs which mirror that the block or problem is already over. For instance, if you chronically start worrying about money instead of giving yourself over to the next steps on your project, you might open a special bank account that you tithe a percentage of your earnings into, to symbolically or literally fund creative time. There are some other ideas about breaking through money blocks here; (remember, the pain is in the brain, not the cash or lack of it). Our friend at the beginning of the article takes her attention off brain-created pain sensations and throws herself into singing. When attention engages freshly, its previous focus disappears. We've all experienced this. While you're ripping open an envelope containing the answer you've been waiting for, you don't notice the toe you just stubbed. And if you don't feel pain, it's not there. It may take focused intention to recognize that a block mechanism is in process, and to then redirect that attention energy elsewhere. Or, it might be as easy and natural as cooperating with the urge to let out a sigh, stretch your body, take a drink of water and refresh yourself. You don't have to know the solution yet--that may come anytime as the gift of an insight from your deeper intelligence. Your channel to the infinite and mysterious source of all creative inspiration is still here, no matter what temporary weather of reactivity you're experiencing. and live with the clarity and ease of your natural wisdom? to the reality of your own brilliance in action.